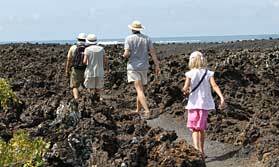 Lava Lodge is just 5 minutes from the main town on Floreana, the least populated of the Galapagos Islands. It offers comfortable accommodation and is a good base from which to explore all the island has to offer. There are 10 self-contained guest cabins, each with its own bathroom with hot and cold water, veranda and outdoor reading area. Cabins are air conditioned. Most rooms accommodate 2 people, but some have bunk beds and can sleep 3. The main building and cabins are built from pine from local forests. It is set on one of the most secluded bays on the island, a short walk from a lovely swimming beach and also close to the loberia, where you can observe sea lions. The lodge has kayaks, paddle boards and snorkelling gear for you to use during your stay. Let us help you plan your perfect tailor-made holiday to Galapagos Islands. Talk to one of our travel experts. Tell us what you want, and we will tailor make your perfect trip.